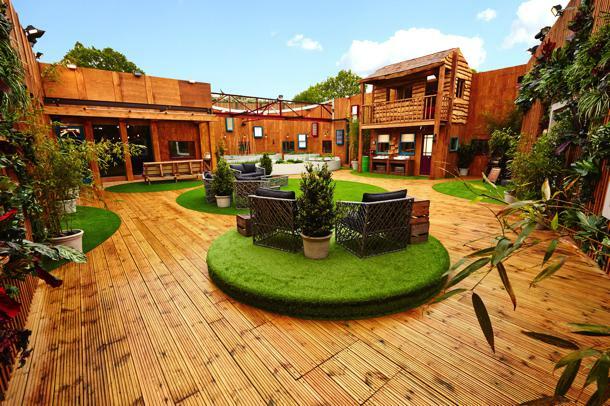 Channel 5 has today released pictures of the new Big Brother House. In the Big Brother: Secrets & Lies House it’s all about self-sufficiency and recycling. As the housemates enter through the front doors they will be greeted by a huge feature wall containing recycled life size front doors. The sweeping staircase will take them down into an eco-style living space. Although impressive in appearance, the House, according to Big Brother, is not a hotel and provides a tougher environment than ever before. The house, based at Elstree Studio in Hertfordshire, was completely gutted inside and rebuilt from scratch with wooden walls and floors, chairs made of old bike saddles, a treehouse and a vegetable patch. Big Brother returns to Channel 5 at 9pm on Thursday 13th June 2013.